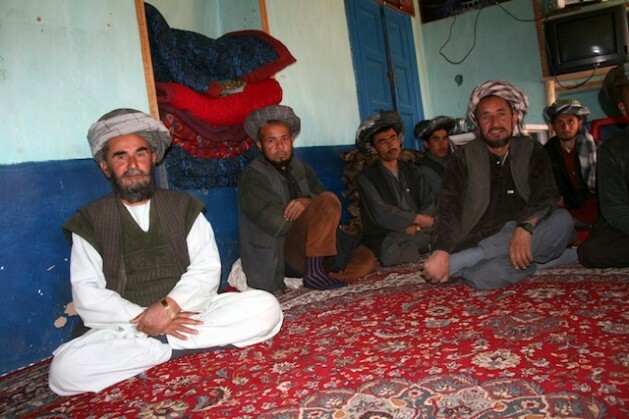 A meeting of the local shura (council) at Zarshay village in Kesht Valley in Faryab province. Credit: Giuliano Battiston/IPS. KABUL, Sep 7 2012 (IPS) - More than a decade after the fall of the Taliban, Afghanistan is still in the midst of an irregular war. Talking peace is difficult because no one quite knows who to talk to. The efforts gain significance coming ahead of the UN General Assembly meeting Sep. 14 on promoting a culture of peace. As officials talk, more ground-level efforts are being led by civil society groups. New efforts have been made by officials to talk to anti-government groups, driven by the 2014 transition date when responsibility for security will be transferred fully to Afghan authorities, and when most of the international forces are due to leave Afghanistan. Many social activists in Kabul see such efforts as unproductive. “I am not optimistic about peace,” Sima Samar, who heads the Afghanistan Independent Human Rights Commission (AIHRC) tells IPS. “There is a negative competition on the negotiation issue, with too many players trying to fulfill their own specific agenda, and no clear mechanism regarding who should talk with whom, about what, for which purpose. “The rhetorical clamour over talks about talks has led to a number of desperate and dangerous moves on the part of the Afghan government and its international allies to bring purported insurgent leaders to the negotiating table,” Robert Templer, the International Crisis Group’s Asia programme director, said in March while presenting the Crisis Group report ‘Talking About Talks: Towards a Political Settlement in Afghanistan’. Analysts say there is an international side to these move marked by attempts by regional and international powers to obtain political ‘sovereignty’ over Afghanistan, and an internal one related to the legacy of the war, which is still contributing to instability. “As for the external factor, by which I mean the interference of regional powers like Pakistan, Iran, the U.S. and others, I believe the Afghan war has already become their own war,” Mohammed Saeed Niazi, director of the Civil Society and Development Centre at Kabul tells IPS. Several Afghan organisations are now focusing more on peace-building projects at the local level. “If you want peace and reconciliation, you have to start by mobilising the local communities, by making them proactive and inclined to take part in the construction of a shared future,” Idrees Zaman, managing director of the Centre for Peace and Unity (CPAU), a non-governmental and non-profit organisation tells IPS. There are other organisations working to plant seeds of peace through social tools. “The insurgents claim the ability to solve and mediate conflicts, and whenever they obtain the trust of the people, inevitably there is a shift of power and authority to them, with negative consequences,” Asif Karimi, project manager at The Liaison Office (TLO), a Kabul based organisation tells IPS. “But once the local communities become able to solve their own problems without relying on external authorities, automatically they eliminate opportunities for the insurgents to strengthen their power. “This way, you can not only mitigate present conflicts, but also reduce the chances for future political conflict. This is our aim in dealing with the local communities.” TLO works in four main areas of activity: research, peace-building, justice and livelihoods. The group has promoted peace curricula for every school class. “We have just started a conflict-resolution project in the madrasas, the religious schools, in order to work with the Islamic young scholars that until now have been isolated and sidelined,” Dalili says. Ali Wardak, an Afghan associate professor of criminology at the University of Glamorgan in the UK who is frequently in his native country for research, says cultural and social tools can be used also for dealing with the Taliban.